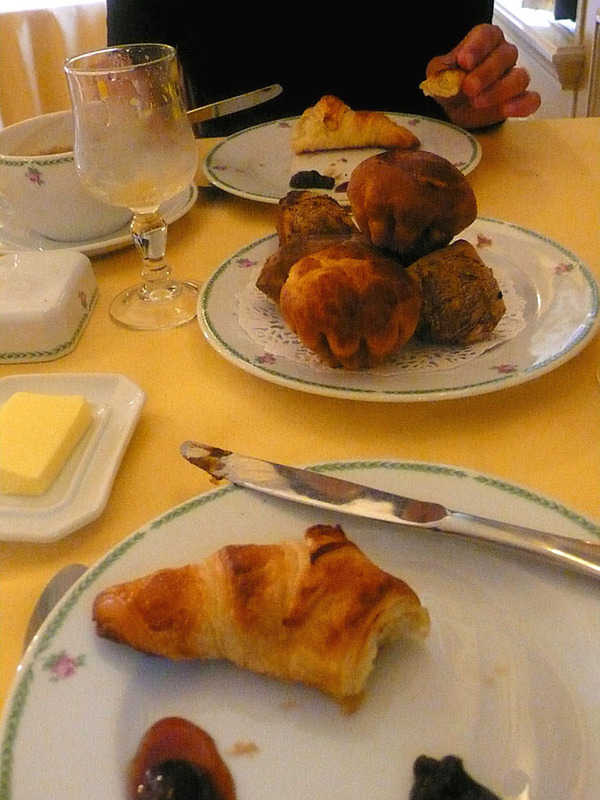 After days of gray and rain, we woke to clear blue sky and went downstairs for the chef's best breakfast, which included an assortment of maison jams and preserves, just-sqeezed orange juice, fresh-made croissants and brioches, a crème with raspberry center, and much more. The main goal of the day was dinner at Errard's and to tour the Langeais château. F. suggested a picnic during another walking tour around the little municipal park lake for lunch, so we bought the baguette, jambon, rosé, quiche, and fresh fruit, and set out along the soccer field stadium path to go over the Loire levee, and to the lake. As picnics go, this one...didn't. We didn't have a blanket, no picnic tables. We ended up sitting on a forlorn little curbing at the end of the muddy lake, watching the wakes of waterbugs and passing joggers. Done, we walked back to town to tackle the château. I do not like guided tours to anything, and was relieved to find we could explore the place at will. The scale of the place was amazing, and some of the tapestries and furnishings were impressive. The completely over-the-top display of 20-25 mannequins in full regalia re-enacting the marriage of Anne-de-Bretagne to Charles of France, staged in the very room where the original event had taken place, was only topped by the slo-mo slide-show and History Channel voiceover in the darkened wedding hall. We escaped into the grounds of the château, sat in the sun, took a few more pictures, and called it a tour. We showed up at table at precisely 8:00 to claim our reservation, and began what was by far the best (and most expensive) meal or event of our vacation. F. chose the mussels in crust appetizer, while I had cold rabbit in jellied salad. F. had a chicken dish for main plat, while I found heaven in a stuffed, roasted pig's foot. My dessert was the best crème brulée ever made in France (I am sure of it! ), while F. tackled a folded apricot crepe of some sort. Two wines were consumed--a Loire white, and a local red Château Bourgeoul. It was a wonderful dinner, and we went to bed certain that we had been in France.